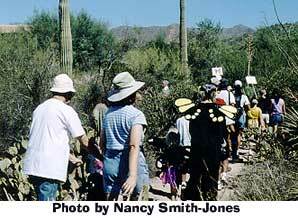 On September 29, 2001 the culmination of the Arizona-Sonora Desert Museum Butterfly Festival took place. This was open to everyone but many of the faces enjoying the festivities were those of Coati Kids. 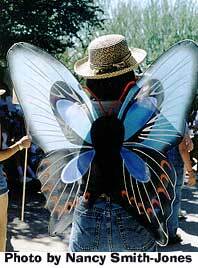 There were butterflies everywhere--both the insect kind and the human kind!! 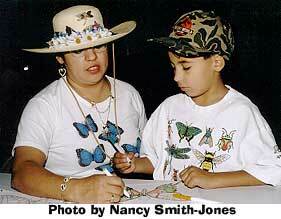 Children and adults dressed up to celebrate the butterfly festivities paraded about the Museum grounds to the sounds of a flutist. There were guided tours to point out and talk about all the wonderful butterflies to be seen. 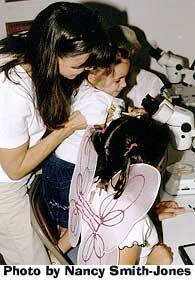 There was an exhibit where caterpillars and butterflies could be examined under the microscope. Beautiful butterflies were drawn and the New Kiva Puppet Theater presented a wonderful skit about a caterpillar that turns into a butterfly. 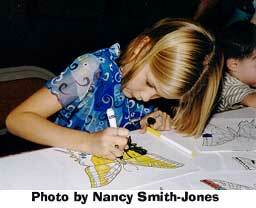 Everyone had a great time and came away knowing so much more about our important pollinating butterflies.